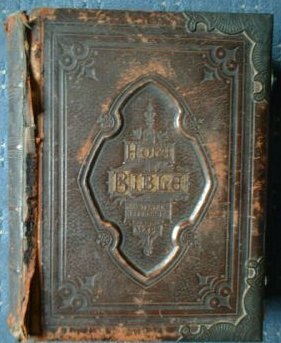 This Bible turned up for Auction on Ebay. 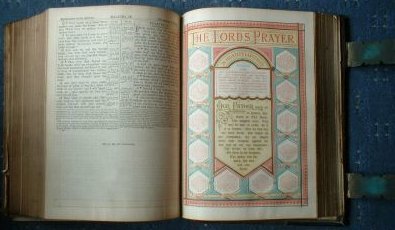 The family tree was traced from the writing inside the front cover. Abraham DOXEY, married 1799, was the common ancestor of Eva Dakin and John Palmer the website author . Bidding:           2 bids, winner etj1947. £5.50 + £9.50 postage. WITH ILLUSTRATIONS, REFERENCES & MAPS. it closed. it measures 13-1/2" x 11" x 3-1/2". weight approx 8kg. The family seem to be in Manchester in 1881 and back in Wirksworth 1891. 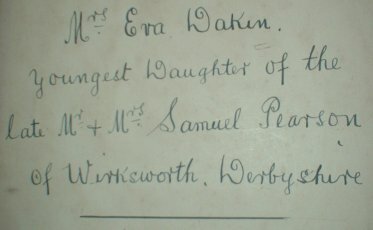 Eva is living with her husband Francis in Ecclesall, Yorks in 1901. From FreeBMD it looks like they were married at Belper Sept Qtr. 1893. Eva's husband Francis was a Police Constable in the 1901c by the way.